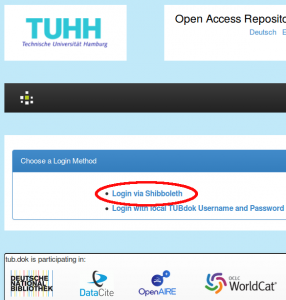 Our Open Access Repository tub.dok is now integrated into the Shibboleth infrastructure of the TUHH. This means that you can use the advantages of a Single Sign On to publish on tub.dok and are not required to login seperately (once you have logged in on the login page of the TUHH computer center). The former login with your TUHH account is not necessary any more as Shibboleth is utilizing the same login data. Authors, who do not have a TUHH account, but want to publish on tub.dok are still free to create a local tub.dok account to publish with this account. This entry was posted in Digital World, Open Access, Publishing, University and tagged Shibboleth, tub.dok by Oliver Goldschmidt. Bookmark the permalink.